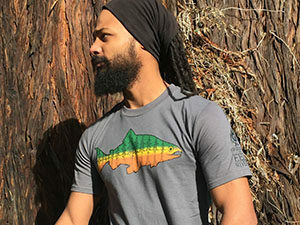 To protect the North Coast’s waters and fish, we need to raise our voices to demand Humboldt County effectively regulate its cannabis industry. Please join us on Monday, March 19 at 9:00 am at the Humboldt County Board of Supervisors meeting (825 5th Street, Supervisors Chambers – First Floor, Eureka, CA 95501) to give brief public testimony before the Board acts to ratify its deeply flawed proposed cannabis cultivation ordinance. The Board of Supervisors is required to accept public testimony before voting on new ordinances. Each member of the public will have three minutes to speak. It’s important to use your own voice, and if you feel comfortable, give a specific example of why this issue is important to you. That said, below are some key talking points and additional background to help you prepare. You can do this! These are YOUR representatives, and they need to hear from you. Fish need clean water. Right now, they’re not getting that. The proposed County regs don’t fix the problem. We have too much weed. We don’t have enough fish. The situation is the worst on the Eel and Mattole rivers, but streams throughout the North Coast region are now impaired by cannabis cultivation. We are losing salmon and steelhead. They are going extinct right now. We’ve lost them in Salmon Creek, and we’re losing them in Redwood Creek on the South Fork Eel. Logging brought them to the brink, but it is undeniably the weed industry that is now pushing ecologically critical runs over the edge. The County has not done the analysis necessary to show how much cannabis cultivation its lands and waters can support. It also hasn’t addressed how Humboldt’s legal weed industry will relate to the larger state market and economy. What does an ecologically and economically sustainable weed industry look like for Humboldt County? Frankly, people don’t want to know because the outlook isn’t pretty. It’s time for the County to take responsibility for righting the wrongs of the illicit weed industry it has enabled. It’s a new day for cannabis in California, and the old black market model is no longer viable. It is a bitter pill to swallow, but the fact is this industry is going to need to significantly shrink if it is to survive at all. And it’s not just about the fish. Both legal and black-market marijuana supplies have far outstripped demand. This cannabis glut is only likely to increase as legalization brings thousands of additional large-scale cultivation operations on line across the state. Prices are very likely to continue to fall, and to remain below the level where many Humboldt County producers can profitably operate. The transition for Humboldt’s economy will be painful, but it is also inevitable. There were at least 15,000 outdoor grows in Humboldt County alone last year. The government’s own estimates indicate that the 4.15 million pounds of bud the North Coast alone produced in 2016 far outstrips the 2.5 million pounds that the ENTIRE STATE will consume in 2018 (both legal and black market). Even if we continue to turn a blind eye to out-of-state illegal markets, they will not be able to absorb the excess. The County still hasn’t done its homework. Don’t permit any new grows in watersheds important for our fisheries until you provide an analysis of how much cultivation a watershed can sustain before negatively impacting fisheries and the environment. Please hone your watershed analysis to reflect the appropriate scale. The proposal offered by the Planning Department to allocate thousands of additional permits across 12 planning basins reflects the same lack of attention to stream diversions and sediment impacts that undermines the Environmental Impact Report’s analysis. Develop and fund a far more robust permitting and enforcement program. The County must show how it will resolve the black market industry and its impacts within the next five years. Accept the fact that the weed industry is going to shrink dramatically. We need to get serious about building a more diversified and sustainable local economy. Humboldt County enjoyed fantastic and completely unsustainable economic benefits from marijuana prohibition. An ecologically sustainable and economically competitive cannabis industry is likely to be an order of magnitude – or more – smaller than the county’s existing black-marked industry. Humboldt County cannot responsibly navigate the future by pretending that cannabis cultivation will continue to provide an economic bonanza. Land use plays a huge role in determining the health of a watershed. While logging, road construction, dam building, and livestock grazing wreaked great historic harm on the Eel River, today, summer water diversions and sedimentation from large-scale marijuana cultivation pose the greatest threat to the river’s native fisheries. With recreational marijuana now legal in California, Humboldt County, long a major center for its cultivation, is responsible for the development and enforcement of cultivation and land use rules that adequately protect fish, wildlife, and watersheds. The overarching law that legalized cannabis cultivation and consumption may indeed be a state issue, but land use planning enforcement has long been the purview of County government. And Humboldt County, which contains the greatest concentration of grows in the state, is failing to meet its obligations in this arena. 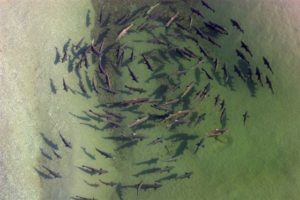 Thus far, the County’s efforts have been wholly insufficient to prevent continued, dire impacts on imperiled salmon and steelhead populations. Friends of the Eel River will continue to insist that the County’s permitting process protect our waters, fisheries, and other public trust values. This may be a controversial stance for some members of our community, but the survival of the Eel River’s native fish is on the line.